Honda Motor Co., Ltd. has announced that it plans to begin testing a driving support system the company has developed starting this month. The onboard support system will use information from infra-red beacons placed next to roadways to offer drivers suggestions regarding how best to handle traffic lights. The idea is to reduce sudden acceleration and decelerations to reduce gas consumption and CO2 emissions, to reduce accidents and hopefully to improve driving conditions for all drivers on the road. The system will work in three ways: two leading up to a traffic light, and the third while sitting at a red light. While driving, the system will keep track of when a red light is going to turn green, or vice-versa, and offer the driver advice regarding how to best proceed. They system can tell the driver what speed to maintain in order to arrive at an upcoming intersection when the light is green. On the other hand, if it won't be possible to avoid a red light, the system will let the driver know that so he or she can begin decelerating slowly. 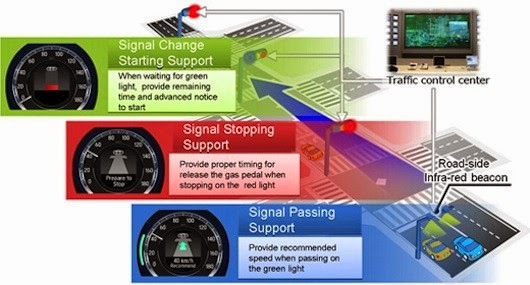 When sitting still at a red light, the system will offer a countdown letting the driver know when the light will turn green so that he or she will be ready for it, thus making unnecessary the need to suddenly accelerate upon finding the light has changed while not paying attention. Honda hopes the system will prove helpful (and safer) for drivers and at the same time offer a way to reduce gas consumption and pollution emissions. The experiment is part of the Universal Traffic Management System (UTMS) initiative being undertaken by several Japanese companies in conjunction with the country's National Policy Agency. The ultimate goal, as with many other initiatives being undertaken by car companies around the globe, is the development of autonomous vehicles a system that relieves congestion using human drivers could very easily be ported to one using self-driving vehicles. The trial is to last a year, starting sometime this month and running on select roads in Utsunomiya City in Japan. One hundred cars will take part, all of which will also provide feedback on how well the drivers are doing. Honda hasn't said if the system would be deployed if the trial proves successful, though it seems likely.